Asheville, NC — Dr. Steven McNulty, research ecologist with the U.S. Forest Service Southern Research Station (SRS), recently received the agency’s national Research and Development “Distinguished Science Award.” He is recognized for sustained research productivity, proactive science technology, innovative leadership, applied forest science, and longtime federal service. McNulty will accept his award during the February 12, 2013, ceremony in Arlington, VA.
McNulty’s individual research focuses on continental-scale forest water, productivity, and health modeling, with emphasis given to interactions and response of forests to global climate change, acid rain, and other environmental stresses. 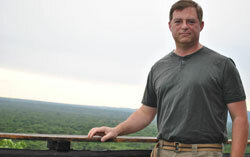 A North Carolina State University USDA Professor of Natural Resources, McNulty also serves as an adjunct professor at the University of Toledo (Ohio) and Beijing Forestry University (China). McNulty received forest and natural resources degrees from the University of Wisconsin - Madison, and a PhD in natural resources from the University of New Hampshire, under the direction of renowned scientist Dr. John Aber. He leads a dynamic research team within the SRS Eastern Forest Environmental Threat Assessment Center, located on North Carolina State University’s Centennial Campus. An internationally recognized expert on climate change issues, McNulty spearheads development of research and tools designed to help land managers better understand and cope with climate change impacts on forest management.